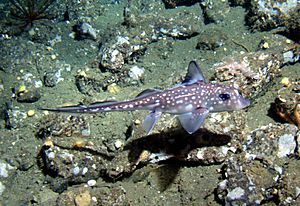 Chimaeras are cartilaginous fish in the order Chimaeriformes. They are sometimes known informally as 'ghost sharks'. They may be the "oldest and most enigmatic groups of fishes alive today. Their closest living relatives are sharks, though in evolutionary terms they branched off from sharks nearly 400 million years ago and have remained isolated ever since. At one time they were a "diverse and abundant" group, based on the fossil record. They are now confined mainly to deep water. There are 50 living species in six genera and three families. The evolution of these species has been problematic given the paucity of good fossils. DNA sequences have become the preferred approach to understanding speciation. The order appears to have originated about 420 million years ago during the Silurian. The three living families appear to have diverged during the late Jurassic to early Cretaceous (170–120 million years ago. They do not have shark-like skin or teeth. They have smooth scales on their bodies, and three pairs of grinding tooth plates. They have a poisonous spine on their backs between the head and the dorsal fin. Otherwise, they are rather like other Chondrichthyes. They have skeletons are made of cartilage. They use claspers for internal fertilization of females. They lay eggs with leathery cases. They use electroreception to find their prey, which is also common in rays. Chimaera (fish) Facts for Kids. Kiddle Encyclopedia.